Avoid wet days if at all possible – You won\'t be able to get the views from the rain-covered and misted up windows. Equally, avoid the hottest days of Summer as the windows do not open and there\'s little ventilation inside. We are comparing Grand Canal venice Boat Tour Prices from leading ticket suppliers and Try to find you Cheap tickets prices on the market. Admire Venice\'s architecture as you see the years of history unfold before your eyes as it\'s meant to be seen – From the water. The Grand Canal is the most famous waterway in Venice from where you can admire the magnificent palaces noting the Byzantine, Gothic, Renaissance and Baroque styles, the churches, and the bridges including the famous and iconic Rialto Bridge. A visit to Venice remains with a person for a lifetime! A great way to say you travelled on the Grand Canal, especially if you\'re only in Venice for 1 afternoon. A great way to get your bearings and kick-start your trip. Good if you like small groups and dislike crowds like you\'d find on the larger boats. A good way to be informed of the sights you\'re seeing and to learn more about the culture and history of Venice with the opportunity to ask questions. Good sightseeing / photo opportunities are not guaranteed due to weather (if it\'s raining the windows mist up) and if it\'s a full tour some people have to sit inside with just a small porthole window. A good alternative to a walking tour if you want to learn about Venice but cannot walk the 3 hours that a walking tour demands. Your Experience With Grand Canal venice Boat Tour? Meet at the designated place and board your motorboat / water taxi where you\'ll be greeted by your friendly guide who will share the culture and history of Venice with you as you pass by Venice\'s most loved and admired architecture on the Grand Canal as well as travel on some of the lesser known yet equally stunning canals. First off you\'ll be able to delight in the scene that is St Mark\'s with St. Mark’s Basilica and the Doge’s Palace viewed from the water. You\'ll pass by the stunningly ornate Church of Madonna della Salute and palace after palace. 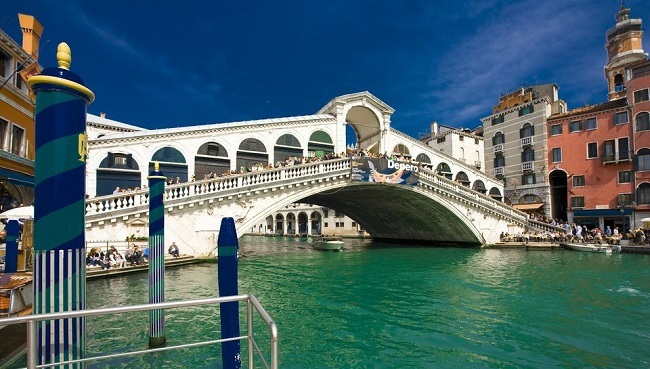 Get a great view of the Rialto Bridge as you continue to admire not just the architecture but also the gondolas and get a glimpse into everyday life in Venice. Towards the end of your tour you\'ll join the quieter and smaller Giudecca Canal before making the return loop back to St Mark\'s. What Grand Canal venice Boat Tour Includes? Try to get a seat in the open section of the boat, you can\'t get as good views from inside the boat. Travelers Reviews about Grand Canal venice Boat Tour? Travellers talking about this tour of the Grand Canal on GetYourGuide, TripAdvisor, Viator, and Ticketbar give it good reviews for the most part, almost everyone agreeing that the friendly, knowledgeable guide helps make this trip worthwhile. Travellers note that due to this being a water taxi style boat not every passenger can get an outdoor seat to enjoy the view – Some people have to sit inside looking out of a small porthole which isn\'t good for taking photos as this is not an open-top touristic boat, it\'s a covered water taxi. The motorboat allows a fast ride meaning people on a limited amount of time the ability to see a lot within 1 hour including some of the lesser known canals. A lot of people had concerns or problems with finding the meeting point due to crowds in St Mark\'s and not being able to see the lady holding the small sign at first – Just arrive in plenty of time and you\'ll be ok.
Not fully accessible for wheelchair users / those with mobility difficulties – Contact the local tour operator directly to discuss your needs and you will be offered an alternative tour or more suitable route. E-tickets and paper tickets are both accepted. During high tides (particularly during the Winter months) the tour might have to be adapted to weather conditions. Be at the meeting point at least 15 minutes before departure – Due to the crowds, it can be somewhat difficult to spot your guide at first. Alilaguna ticket office, San Marco - near the entrance to the Royal Gardens.